As we rub the sleep out of our eyes on this Wednesday morning we suddenly realize, The Dram Shop is open! These last weeks have been a blur of long days and nights, incredible hard work from friends and family, and of course frantic last minute preparations. In fact, we procured our Business License and Certificate of Occupancy around lunchtime on a Thursday, finally got our point-of-sale system set up at 2:30 p.m. and our private opening began at 4:00 p.m. Plenty of time to spare I kept telling myself. And what has been the best part so far? It’s really hard to say, so maybe I should just stick with the laundry list approach. 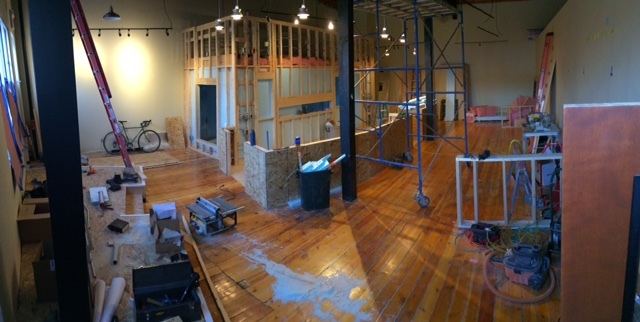 We’ve dealt with the shock of seeing our saw dust laden construction site go from filthy to beautiful almost overnight. And it turns out, you really can put lipstick on a pig. We’ve gotten to see reactions from friends, family, and colleagues as they see our place for the first time, which is just too much fun. We’ve had the pleasure of being on the receiving end of so many congratulatory messages, it’s overwhelming, but in that awesome way. But the most satisfying thing we’ve seen, is people coming through the front door, ordering a beer, and filling up a growler to take home with them. And it remains a bit hard to believe that we can already provide this service for folks. It seems like only yesterday we were trying to figure out what the best floor plan for our place would be. In truth, there’s really far too many people to thank. We had so much help along the way, it’s really been a very humbling experience. So if you are one of those folks, we can’t really say how much we appreciate the support. And if you’re not one of those folks, well, come on by for a drink and we can fix that problem in a hurry! 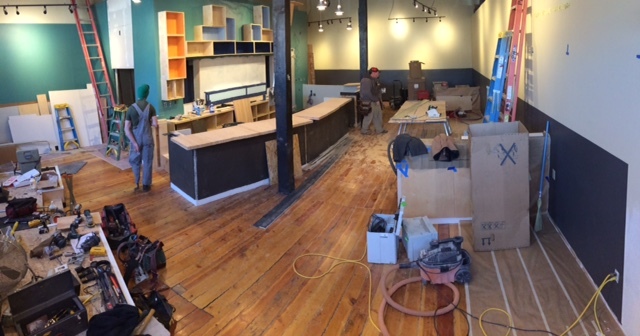 The Dram Shop, a growler fill station and taproom for lovers of craft brewing in downtown Missoula, Montana is well on the way to becoming a reality with the opening now less than two weeks away. McNelis Architects, recently licensed to practice in the State of Montana, worked with proprietors Zach and Sarah Millar to capture their conceptual vision for a family friendly environment to showcase the well-established local micro brews as well as regional offerings. Located in the historically designated 100-year-old Missoula Mercantile Warehouse Building, the design defers to the exposed 20 foot tall brick walls and fir timbers. McNelis Architects, with John Geurts as project lead, provided complete architectural, engineering, and interior design services from site selection and initial schematic design through construction management phases including documents for all permitting and construction. Interactive virtual walk-thru renderings and shop drawings were produced in house. New simply detailed wood and colored surfaces introduce an inviting and engaging feeling into the airy space. Stainless steel and ceramic tile surfaces support the sanitary conditions at the back bar. The carefully designed lighting considerations illuminate the appealing variety of the liquid hues as well as the rotating gallery hangings on the surrounding wall surfaces. The new bar top itself showcases sustainable engineered laminate structural fir which enters a design dialog with the original fir floor. Plans for future growth were incorporated in the design from the inception. In coming months, new folding glass doors will open and invite patrons to enjoy covered sidewalk seating in the Rocky Mountain air. 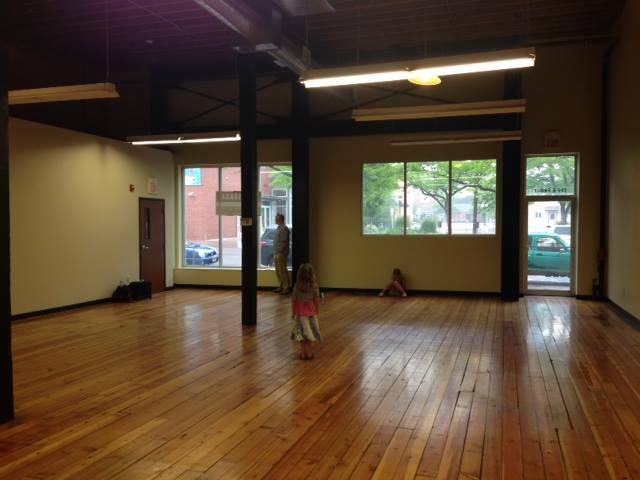 Before: Vacant tenant space when the lease was signed with members of the Millar family. Proposed view from the entry. 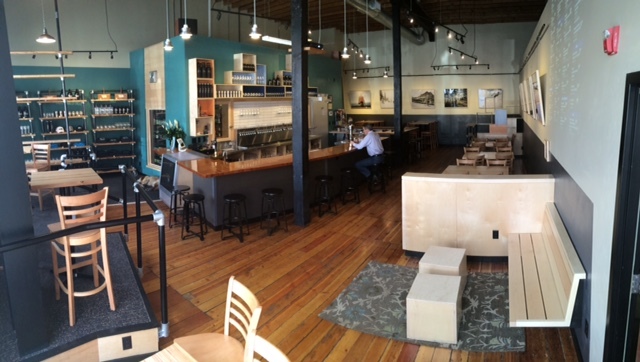 Proposed view of the bar with 32 taps. 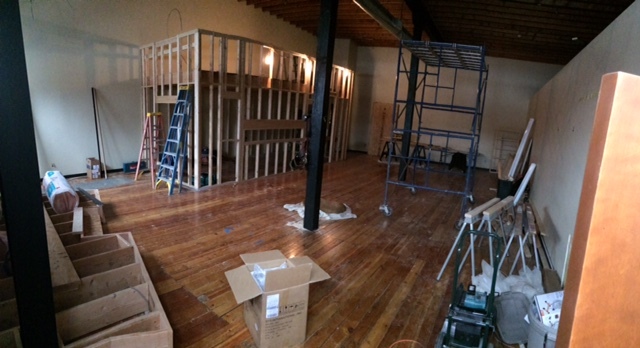 Stud framing for the custom built walk-in-cooler complete with electrical work. 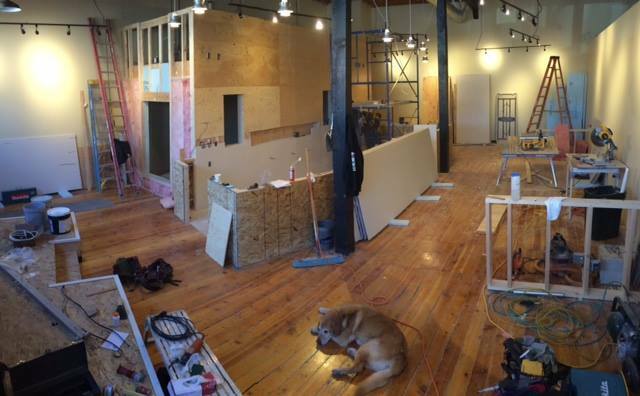 Insulation and drywall underway and cable suspended track lighting complete. Wall painting in progress and cabinet delivery. 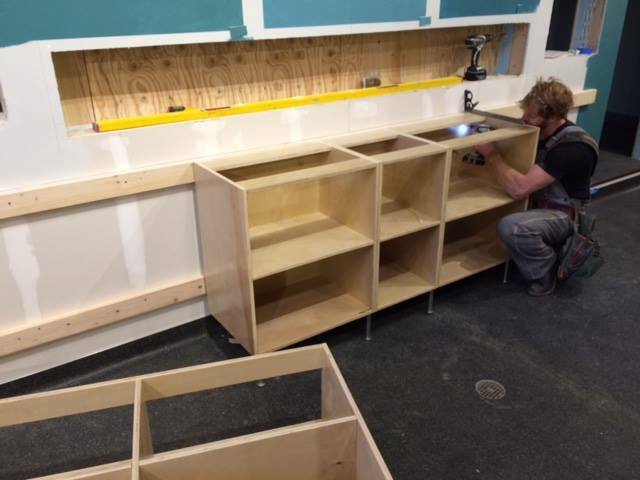 Completed sheet flooring, and Levi installing the back bar base cabinetry. 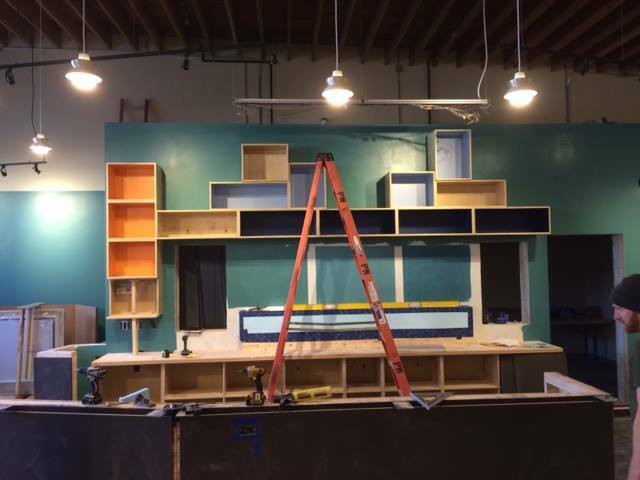 Back bar and bar front installation. 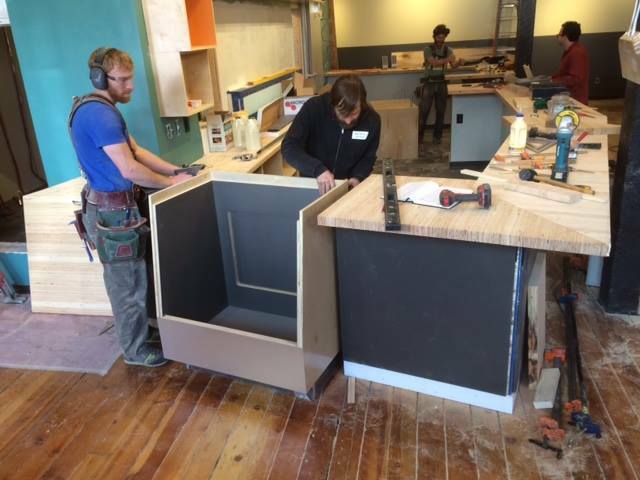 Bar installation and setting the cask keg display case with Damian Mast & Co.
Hello there, and welcome to The Dram Shop Blog! 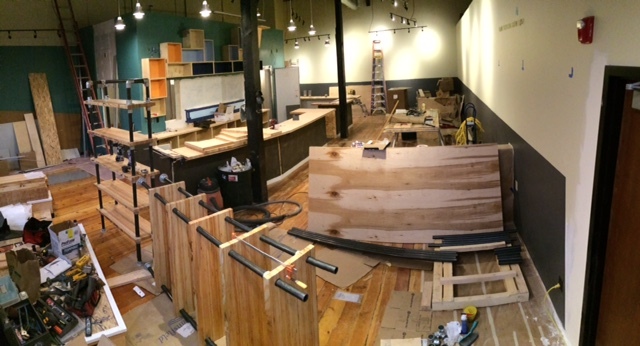 It’s hard to believe it, but we have arrived, and our growler fill station is quickly becoming a reality. 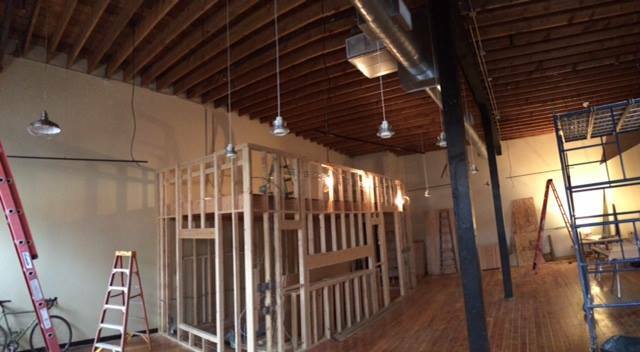 I’ll be posting here as often as I can to keep you all in the loop with what is going on around 229 East Front Street! The last eight months of getting our business off of the ground have been extremely fun and educational, not to mention nerve wracking at times. We’ve tried to choose options for our place that are cool, fun, and don’t break the bank. Yes, they do exist, but have been particularly difficult to find. We’ve worked hard at it, and also enlisted John Geurts with McNelis Architects, who, lucky for me, also happens to be my brother-in-law. 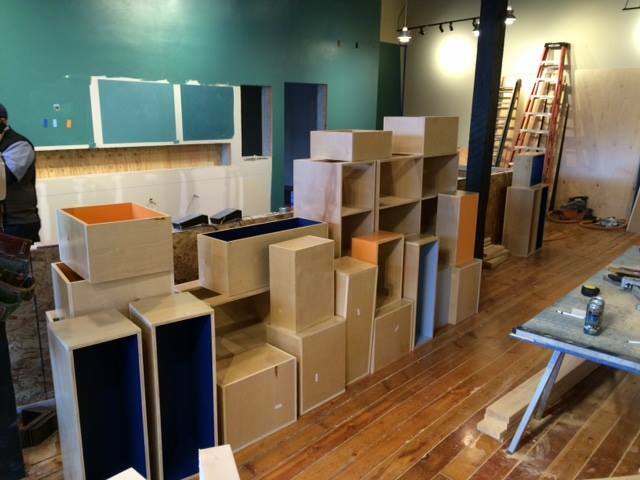 This is the story of finding an awesome material for our bar top and table. John and I talked about everything from formica to granite to concrete as options, and were having trouble finding something that we thought was original, but would also be functional and attractive. That’s when John mentioned that he had recently been to a door manufacturer in Denver, and had seen some cool materials that they use to make their solid wood doors. It’s basically a laminate of thinly ripped boards, and they use it to build doors for it’s strength, and because it doesn’t move over time. The only problem he said, is that they then paint the doors and you don’t get to see the beautiful stripes of wood all laminated together. We both thought it was a material worth pursuing. Turns out, it’s virtually the same material used in Structural LVL (laminated veneer lumber) beams. 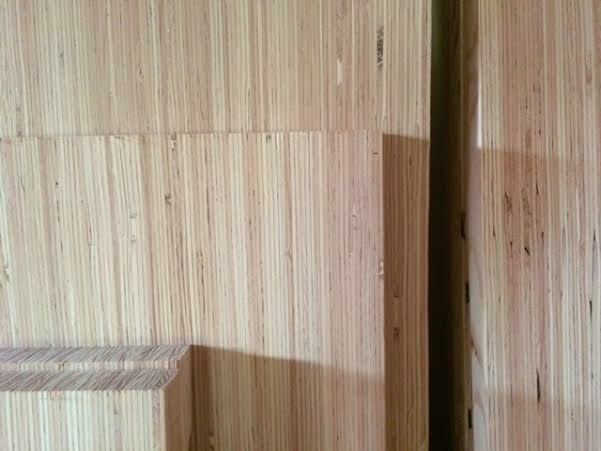 Not only are these far cheaper than a solid wood door, they are available at our local lumber yard! 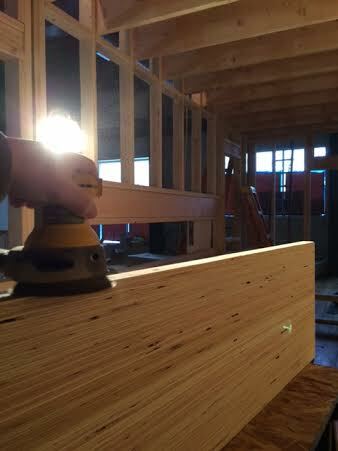 Once we decided on this material, we purchased enough structural beams to rip into lengths and re-laminate into our bar top and tables. We then drove them up Evaro hill and dropped them off at Buckeye Hardwoods in Arlee. After a week or two, Bob at Buckeye called and said that they had been ripped, laminated, run through Buckeye’s enormous drum sander, and were ready to pick up. I knew this was going to be a somewhat important event, so I tried to plan accordingly. First of all, I knew that our Honda mini-van would not suffice to haul nearly a half ton of finished lumber from Arlee all the way back to Missoula. I needed a truck, and I knew just the one. My friend Will has an old, and well loved Ford F-150 named Bubba. Now Bubba may have a few minor dents and scratches on him, and he may be missing a window crank handle or two, but he is always up for an adventure. Next I needed a co-pilot. Now I can think of lots of people who are great navigators with a map in their hand, or maybe have the mechanical acumen to fix a broken down Bubba, but I can’t think of anybody who offers the same steely resolve and emotional support as our 10-year-old, 100-pound labrador Leeroy. Not only does he have the experience necessary for such a mission, he has the get up and go. OK, well maybe he needs a bit of a hand getting into the back of the truck these days, but he is definitely not lacking in the enthusiasm department. So Leeroy and I gassed up Bubba and headed north to Arlee. 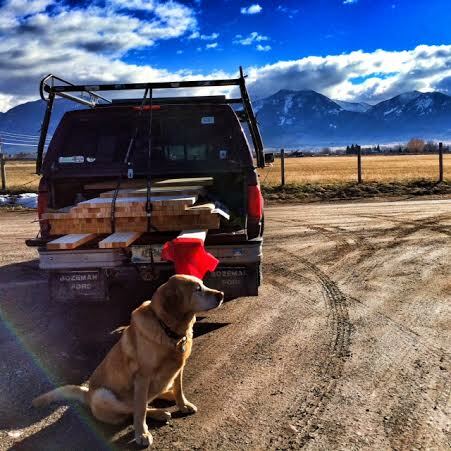 We had no trouble checking to make sure we had everything we came for, and loading the lumber in the back of the truck. Turns out Leeroy is very handy with a forklift. We were nearly tied down and back on the road when we found ourselves chatting up Buckeye Bob. And it’s true that we may or may not have spent close to an hour listening to Bob’s harrowing tale of being thrown from and subsequently pinned down for hours by his trusty horse while hunting in the Beartooth Mountains. Turns out he and the horse were both lucky to come away from the experience with only a few broken ribs and one heck of a story. By the time we got back to Missoula with our bar and table tops, Leeroy, Bubba and I had nearly planned our next adventure into the wilderness. Or maybe we just relaxed over a couple of Milk Bones and took in the scenery. And from there on out there was nothing left to do but put the finishing touches on them with the orbital sander, and send them off to St. Ignatius for the final clear coat finish.